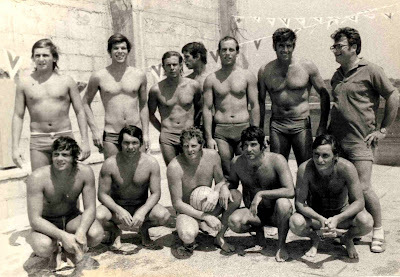 The National team of Israel during a training camp at the outdoor of Wingate Institute in 1973. The team was preparing to play against Iran in Teheran, in order to qualify for the 1st World Championships in Belgrade, September 1973. Standing L-R: Hagai Zisch , Guri Huberman , Dubi Kroll , Benny Karny , Oded Rosenfeld , Micha Kanitz , coach:Gabi Winkler. Seated L-R: Peter Schtoff , Robert Rosenthal , Yoel Samuel , Robi Ladner , Israel Racheli.